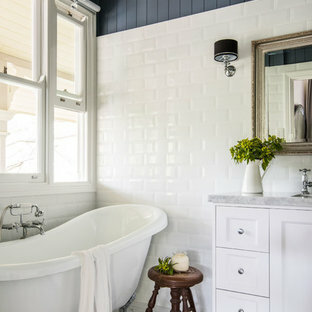 Inspiration for a country master bathroom in Omaha with a freestanding tub, a corner shower, black tile, black and white tile, white tile, grey walls and multi-coloured floor. 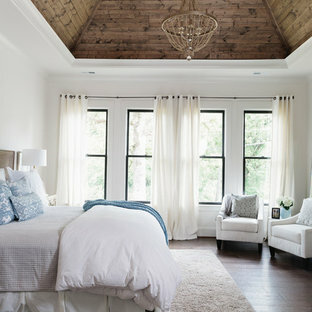 Design ideas for a country master bedroom in Birmingham with white walls, medium hardwood floors and brown floor. 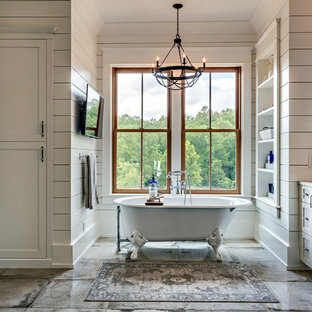 Photo of a large country master bathroom in Nashville with shaker cabinets, grey cabinets, a claw-foot tub, white walls, grey floor, a corner shower, concrete floors and an undermount sink. 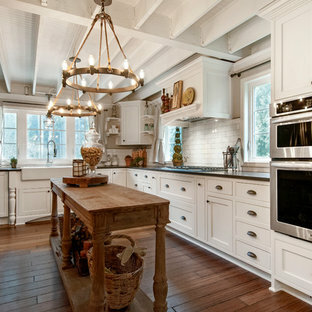 Design ideas for a country eat-in kitchen in Boston with medium hardwood floors. 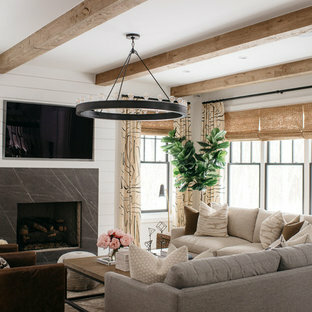 Design ideas for a country living room in Detroit with white walls, light hardwood floors, a standard fireplace, a stone fireplace surround, a wall-mounted tv and beige floor. Photo of a country u-shaped eat-in kitchen in Seattle with a farmhouse sink, shaker cabinets, white cabinets, white splashback, subway tile splashback, stainless steel appliances, quartz benchtops, medium hardwood floors, an island and brown floor. 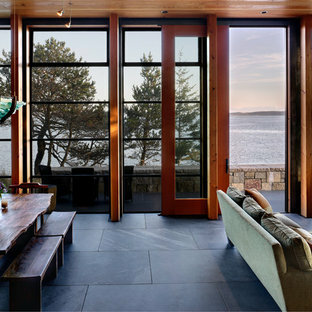 This is an example of a large country formal enclosed living room in Houston with green walls and brick floors. 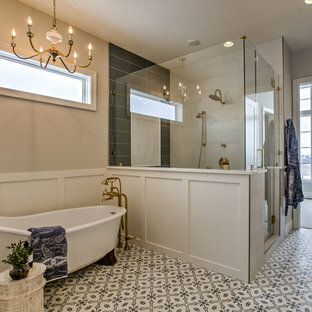 Inspiration for a large country master bathroom in Philadelphia with a freestanding tub, gray tile, grey walls, light hardwood floors, an undermount sink, engineered quartz benchtops, furniture-like cabinets, grey cabinets, a corner shower and beige floor. Design ideas for a mid-sized country master bedroom in Nashville with grey walls, dark hardwood floors and no fireplace. Photo of a mid-sized country single-wall eat-in kitchen in Philadelphia with raised-panel cabinets, beige cabinets, brick floors, an island, a farmhouse sink, panelled appliances, red floor, concrete benchtops and grey benchtop. Photo of a country patio in Burlington with tile and a gazebo/cabana. 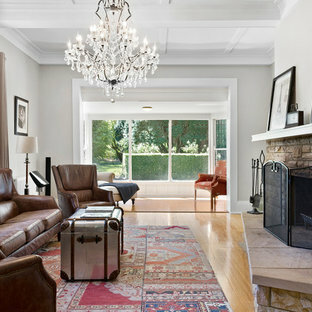 Photo of a country open concept family room in Burlington with beige walls, a wall-mounted tv and grey floor.